Sis Eunice Harrington, Bro Charles Smith, Sis Green, Bro & Sis Bell, and others. In 1931 the Church moved into the old Union Baptist Church building for just a short while, after which time they moved to a building on Fourth Avenue (formerly Blue Heaven) and remained there for several years. They moved again to a building on Central Avenue and Elder Goode ceased to be the Pastor. Subsequent pastors included: Elder Moses Bradley, Elder Chester Williams, Elder Roscoe Stevens, and Elder Clifton J. Fulton. In 1936 the church at 3500 First Avenue was finished being built. 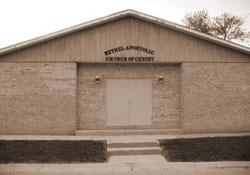 Elder Fulton became the pastor and during this period the church was named Bethel Apostolic Church of Christ. Elder Fulton served as Pastor from 1936 until 1941, after which time he was called to be the Assistant Pastor to Bishop Karl F. Smith. In October 1941 Elder Richard E. Aden became the Pastor. During Elder Aden’s Pastorship, the Church, which now stands at 2809 Maple Street, Urbancrest, Ohio was purchased in October, 1966. Elder Aden remained the undershepherd until his death on June 25, 1975. Following Elder Aden’s passing, Elder Robert L. Mitchell was elected as his successor in July 1975, and installed as Pastor in January 1976. Under his leadership the front edition to the church was built and additional land was purchased. Due to health complications, Elder Mitchell retired as full-time pastor on December 2, 2000. He remained faithful to the Lord, serving as Pastor Emeritus until his passing on July 12, 2003. Elder Richard A. Lyles was officially installed as Pastor on June 3, 2001, after serving as Assistant Pastor under the leadership of the late Elder Robert L. Mitchell for a few years. Elder Lyles shares the vision of building up and maintaining the House of God.